I recently read a couple of articles on artificial intelligence, one an interview with historian, Yuval Noah Harari, and the other written by computer science geek (like me), Tim Urban. I was intrigued not by the technology discussion, but by the discussion of the exponential nature of human history. Quick math refresher. An exponential curve is a function that increases by a power of x (2, 4, 8, 16, 32 . . .). A linear curve (a straight line) increases by a factor of x (2, 4, 6, 8 ,10 . . .). 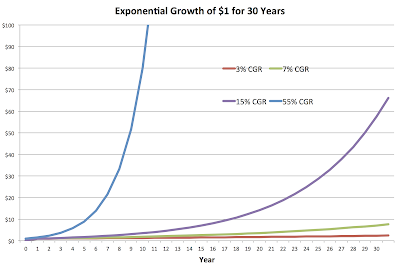 The following graph shows four exponential curves with growth rates of 3%, 7%, 15% and 55% per period. The 55% growth rate is extreme but comes into play shortly. Urban explains the exponential nature of human development in an interesting way that I will summarize here. An adult from 1750 would be overwhelmed if he were transported forward by time machine 266 years to 2016. To achieve a similar state of awe in 1750, a person living in that year might have to have been transported back 14,000 years in time, according to Urban. Meanwhile, we Baby Boomers would probably have been shocked back in 1960 to see what life would be like today, 56 years later. In 1985, there were no cell phones, let alone smartphones, my Telemail email account was a rarity (most people had no idea what email was), global terrorism wasn't nearly the issue in the U.S that it is today, the Cold War had just ended, personal computers stored data on 10-megabyte hard disk drives (1/100,000th the capacity of today's one-terabyte hard drives), and driverless cars were a pipe dream. In the early 1990's, I flew the supersonic Concorde from London to New York. My grandfather rode to school on a horse. In 1991, the Cold War ended. Urban also includes the following illustration of exponential growth courtesy of MotherJones.com. I won't repeat the entire explanation here since it's explained well at the MotherJones.com post, but here's the gist. If you started refilling a dry Lake Michigan in 1940 by adding 1 ounce of water and then doubled that amount every 19 months, after 70 years you wouldn't have much more than a very large, extremely shallow puddle. But, “by 2020, you have about 40 feet of water. 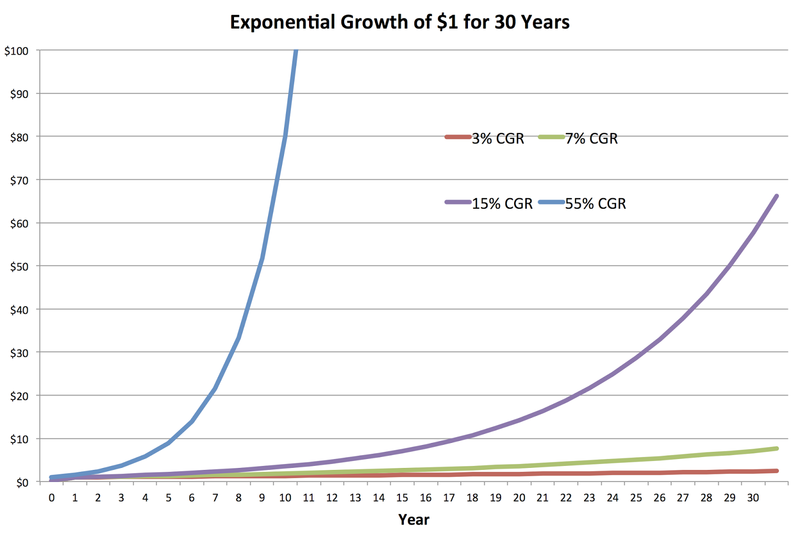 And by 2025 you're done.” Exponential growth can crawl along glacially for a long time and then whoosh! right by you. If I handled such large numbers correctly, the annual growth rate in the Lake Michigan demo is about 55% a year. Not many things grow that fast for any sustained period, let alone 85 years, but the whoosh! effect is pretty dramatic at this rate. The greater the growth rate, the more dramatic the difference between “waiting forever while nothing much happens” and “whooshing! by”. Consider it an exaggeration for effect. The demo also explains rather dramatically why a bear market late in our careers can be devastating. Half of the six quadrillion-gallon lake is filled in the last 18 months of the 85-year process. Your 401(k) growth is not nearly so dramatic, but your balance could double in the last 10 years of your career. Not as awesome a whoosh! as filling a lake at 55% annual growth, but still, one you don't want to miss. As you can see, the length of time required to inspire awe becomes shorter and shorter at an amazingly fast pace. That's the nature of exponential growth. 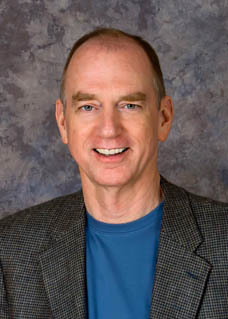 The implication for retirees is that if human development (and computer development, as the AI argument goes) continue at this incredible rate of growth, it is not only unreasonable to believe that you can predict how your life will change over a 30-year retirement, but it will become more and more unreasonable for future generations to do so.